The ultimate Limousine Winery experience- includes a bottle of Moet on arrival, cheese platter morning tea and a 3 course gourmet lunch. 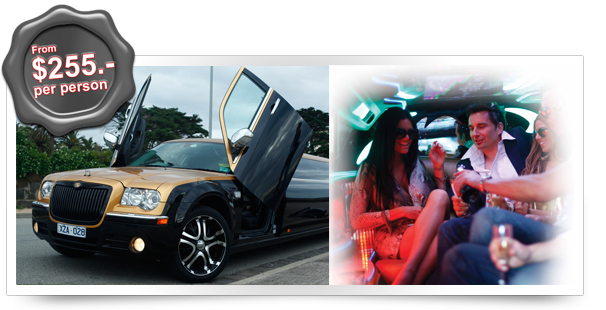 For the Ultimate in Luxury Tours – MORNINGTON PENINSULA LIMO TOURS The Ultimate Limousine Winery & Food Experiences …. On arrival, crack open a bottle of Moet, a cheese platter and a 3 course meal. Platinum Package-$255 per person (minimum 6 people) Starting Melbourne Winery Tours head out to the delights of the Mornington Peninsula The ultimate Limousine luxury tours experience- includes a bottle of Moet on arrival, a cheese platter, sit down tasting, chocolate indulgence and a 3 course gourmet meal. When only the Best Luxury Tours will do for that Special Gift, Birthday Celebration, Promotion or perhaps job well done Christmas Party Function. first 3D TV roof or the black and silver with an inbuilt Karaoke system. Our team of professional and dedicated chauffers will ensure you arrive completely relaxed. when your chauffer driven limousine arrives Step into the stylish Phantom Chrysler 300C of your choice on arrival, sip on fine champagne and enjoy a pleasurable 1 hour drive from Melbourne to the Mornington Peninsula. Explore your taste buds with fine wine, champagne and a decadent platter of locally produce cheese exclusive to the Mornington Peninsula. Continue to indulge at a Prestigious Winery where you will also enjoy a tasting and 3 course gourmet lunch whilst being surrounded by beautifully picturesque vineyards. Hop back into the stylish Phantom Chrysler 300C and enjoy the scenic route to more exclusive Wineries for more wine tasting! I thought it might be something for you. Platinum Package and is located at http://morningtonpeninsulalimotours.com.au/platinum-package.